"Comets appear to be quite different compared one to the other, " Rotundi told Space.com via email. "This comet confirms that we would be wrong speaking only of dirty snowballs." "Comets have always surprised humanity, " Murthy Gudipati, a University of Maryland scientist and Rosetta team member, said in a statement. 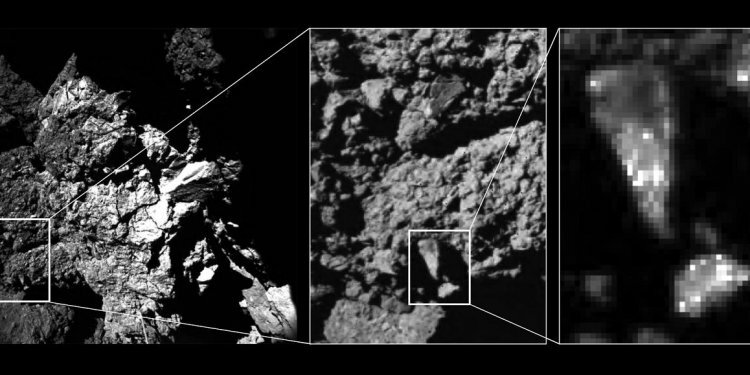 "[Comet 67P] C-G seems to be no exception." "You might sink in into the smooth dust where we find the thick snow-field like layers, other areas might be robust enough to carry you, " Sierks told Space.com via email. "The dust is dry like power." Comets are debris left over after the solar system formed 4.6 billion years ago. Let's see what you know about these ancient and elusive celestial wanderers. Rosetta scientists are expecting the comet to change quite a lot as it makes its way around the sun. Rosetta and the comet will make its closest approach to the sun in August, and the spacecraft should continue studying the comet until around the end of 2015. "I want to see erosion of the weakly consolidated material and want to see something collapse. And I want to see a ripple move, " Thomas told Space.com via email. "Also, the sun is slowly moving towards the southern hemisphere and who knows what we will find there. The action is just starting so I'm confident that we are going to have some fun."